I love a good punch and I never entertain without whipping up a punch of some description. 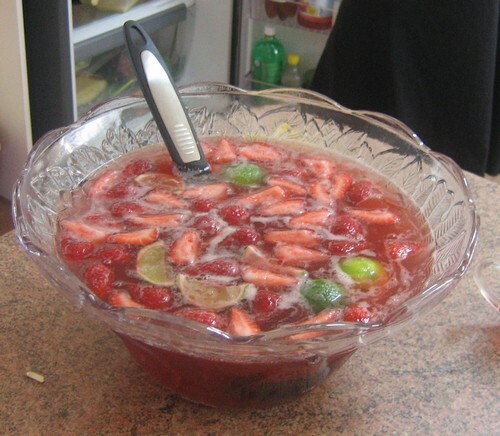 Last nights punch was fairly tame as far as punches go due to the number of people driving. Pour everything into a punch bowl and enjoy! Replace cranberry juice with kiwi fruit juice and add lychee liqueur as well as the sparkling. Add passionfruit pulp and kiwi fruit instead of the strawberries and lime. The best punches I’ve made have been the spontaneous, just throw it all in, variety and sadly I have no recipes for those!